Theres a rumble in the jungle, and Donkey Kong is right in the centre of it all! After a long hiatus, the ground-pounding gorilla is back in an adventure that harks back to the classic platforming days of the Super Nintendo Entertainment System. With new levels and updated graphics, and further levels added since the game appeared on the Wii, Donkey Kong Country Returns is the perfect nostalgia trip. Youd think with such an epic return, DK would be all about saving the world or something equally fantastical. But no - the animals of Donkey Kong Island have, under the control of a group of evil Tikis, gone and stolen his stash of bananas. 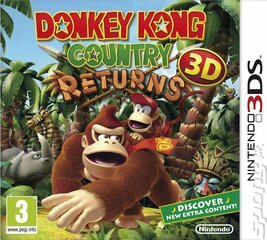 Donkey Kongs mission is to get them all back at any cost, and his friend Diddy Kong is back to tag team the adventure with him. its all present and correct, with a new lick of graphical paint that feels fresh and retro at the same time. Tackle the increasingly challenging stages on your own as either DK or Diddy, or grab a friend and complete stages together. 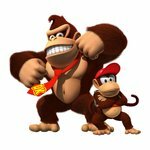 Two heads can be better than one after all, and with DKs brute strength and Diddys jetpack and nimble agility, that rings true in Donkey Kong Country Returns too.